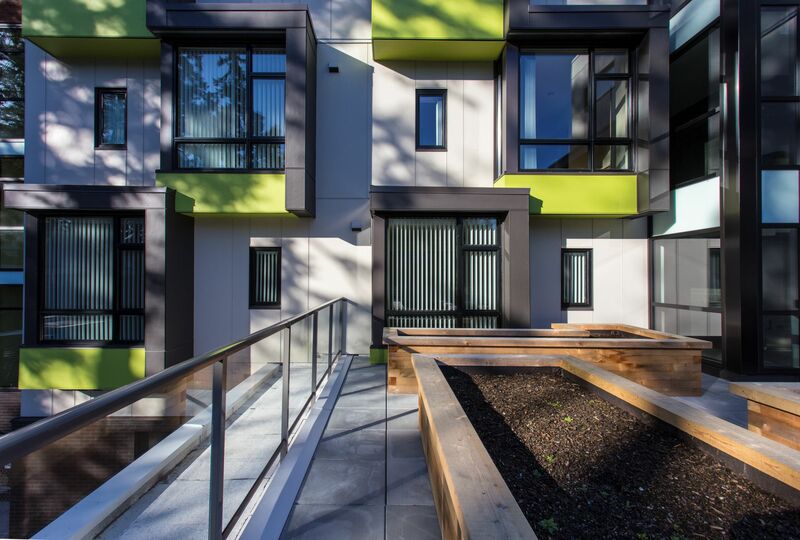 This project in Nanaimo provides 33 units to house individuals and couples who were homeless or at risk of homelessness because of mental health or addiction problems. The building has a mix of studio and one-bedroom apartments ranging from 35m2 (375 SF) to 52m2 (560 SF), along with administrative staff facilities, and common kitchen, dining room, multi-purpose rooms, laundry, fitness room, and secure bicycle storage. Each unit contains a large glazed bay window, a basic kitchen, bathroom, and personal storage. The 2400 m2 (25,800 SF) building is a four storey wood-frame structure with a second floor roof top food-garden terrace and a ground floor south facing plaza with bocci court, landscape gardens and covered seating area. The building’s design is intended to strike a balance of form, character, and materiality that fits with its neighbours in the heavily-wooded context. The building is designed to be highly energy-efficient, with performance designed to CaGBC LEED Gold.